The worldwide Bahá’í community has advanced significantly since Bahá’u’lláh disclosed His mission in 1863. Guided by the systematic unfoldment of the Tablets of Divine Plan, unveiled in 1919, the Bahá’í world, achieved a global spread in a short span of time— from pole to pole and to distant islands and territories. The Bahá’í world community continues to address its growth under the guidance of its supreme governing body, the Universal House of Justice. As the Bahá’í world is now in the third year of its latest Five Year Plan which is to culminate in 2021, it is opportune at this time to reflect on the current status of the growth of Bahá’í Faith and its prospects for accelerated growth in the years ahead. 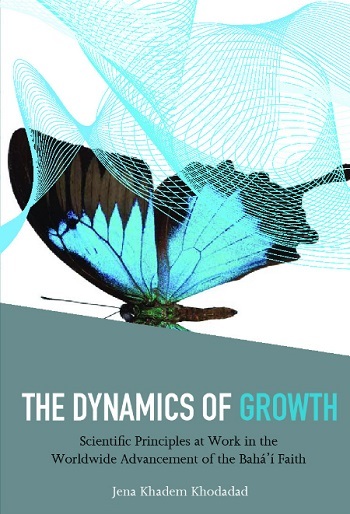 This book, The Dynamics of Growth: Scientific Principles at Work in the Worldwide Advancement of the Bahá’í Faith, employs a novel approach: It applies scientific concepts and principles to the growth and advancement of the worldwide Bahá’í community. It has ten chapters organized under three parts. Its various chapters employ analogies, metaphors, similes, and examples in discussing the question of growth and advancement of Bahá’í Faith. Though its mode of approach may be perceived as unconventional, however, in line with the Bahá’í principle of harmony of science and religion, perspectives from science can provide valuable dimensions to understanding the question of growth. Bahá’u’lláh and ‘Abdu’l-Bahá made extensive use of analogies, metaphors and similes. My fields of study—cell and molecular biology and neuroscience—have significantly enhanced my appreciation of the vital, orderly nature of growth in dynamic systems. Jena Khadem Khodadad, holds a Ph.D from Northwestern University in biological sciences (cell and molecular biology). Her academic career as professor on the medical and graduate college faculties has entailed teaching of cell and molecular biology and neuroscience and research on the molecular organization of biological membranes. The results of her work were presented before national and international scientific forums and published in scientific journals and books. Jena has served on institutions and agencies of the Bahá’í Faith. As an advocate of human rights, Jena has presented before human rights organizations including Amnesty International and the American Jewish Committee on the denial of higher education to Bahá’ís in Iran. As an active member of an interfaith organization, she is dedicated to interfaith understanding and dialogue. Jena is the daughter of Hand of the Cause of God, Zikrullah Khadem and Javidukht Khadem and was raised in a household infused with love and passion of the Bahá’í Faith. She has attained the presence of Shoghi Effendi and presented at numerous conferences, seminars and classes on “Shoghi Effendi, the Guardian of the Bahá’í Faith”– a theme which is integral to the focus of this web talk. Jena’s most recent writing, The Dynamics of Growth: Scientific Principles at Work in the Worldwide Advancement of the Bahá’í Faith, is published by George Ronald. This book applies insights from science to the question of growth of the Bahá’í Faith in particular and to growth of religions in general. Jena and her husband, Manuchehr, live in the United States in the Chicago area.